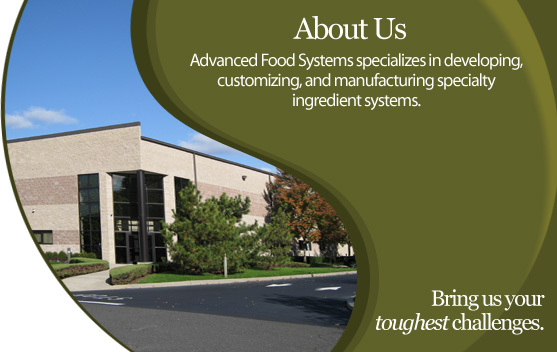 Advanced Food Systems develops and manufactures customized ingredient systems for meat and poultry products, frozen foods, sauces and marinades, and many other products. We're active in almost all food categories. We use spices, seasonings, flavors, stabilizers, emulsifiers, gums and other hydrocolloids, colors, and a variety of functional ingredients to create customized solutions for a broad range of food-service customers. Our specialty ingredient systems are developed through the creative combination of ingredient technology, industry insight, culinary expertise, and processing experience. We can also recommend ways to improve processing efficiency or even create new technologies to help you meet your challenges.